Wii accessories have hit a new level of "Why?" with CTA Digital's Wii Wings. Ever wanted to know what it's like to be a bird? Get a pair of CTA Digital's Wii Wings. 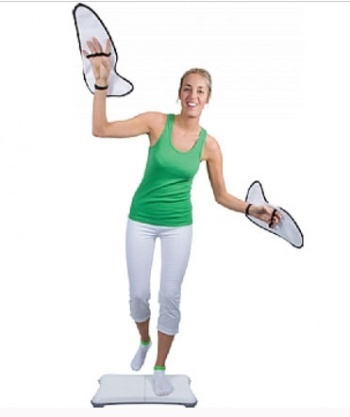 They're designed for use while playing a single Wii Fit Plus mini-game, and aim to give Wii players the true experience of flying. Wii Wings might look like glorified potholders, but they're much, much more. CTA is marketing them towards those that love Wii Fit Plus's Bird's-Eye Bulls-Eye where players must flap their arms to fly a chicken onto targets to score the most points. According to CTA, Wii Wings will "help you to truly experience what its like to be a bird." I'm not one to bash a viable business opportunity, as I'm sure there are people out there that will purchase and enjoy the Wii Wings to no end. Let's face it, these things are pretty damn absurd though, and they highlight the new "absolutely nothing" market of accessories that has been created around the Nintendo Wii. I can't tell you how many people think that you need the Wii Wheel to play Mario Kart Wii, or that golf club/tennis racket Wii Remote attachments are actually more than pieces of plastic. CTA's marketing slogans are basically a load of bunk, even saying that Wii Wings will help players "achieve a higher score." With Sony and Microsoft planning to join Nintendo in the motion control department later this year, it turns my stomach a little to think of the accessories that will be filling up videogame store shelves to capitalize on the lack of knowledge casual consumers may have about what is a controller and what isn't.